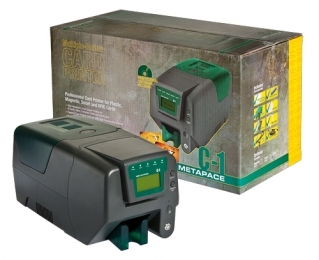 The Metapace C-1 is not just the ideal solution for all applications of single-sided printed plastic cards for professional IDs, name tags and customer retention measures - much more this professional package revolutionises desktop card printing. At an unbelievable favourable price we exclusively deliver you the C-1 with features and performance that cannot be found anywhere else. It could hardly be easier - the printers high performance and sophisticated concept impresses from the start single-sided cards are created in full-colour at high speed and in high quality, whereby the cards are either fed automatically or via a single slot. Even untrained users easily operate the printer, making the C-1 an all-rounder for card printing in trade, in offices and at events. The C-1 produces even complex and demanding motifs with photos, logos and images in high-contrast and luminous quality using dye sublimation with up to 16.7 million colours. It processes cards of different thicknesses and prints with 12 dots/mm 300 dpi in the YMCKO mode at high speed 140 cards/hour. It provides a reserve of a minimum of 100 cards, feeds these completely automatically if needed, prints them out, and makes the design particularly long-lasting by simultaneously covering it with a transparent laminate layer. Print a small number of cards or large print jobs - optimised and long-lasting colour ribbons up to 200 cards per roll are tailored to the high performance of the printer, guaranteeing consistent high quality of required media. The scope of delivery of the C-1 includes as standard a powerful designer software full version at no extra charge. Its user-friendly menu navigation allows even beginners to become professional graphic designers of cards. Individual personalisation of ID cards and nametags, or full-size layouts for customer retention measures are created in seconds and produced in high quality by the C-1. The processors high performance and compatibility with all standard Windows operating systems guarantees easy and high performance in almost any environment. A USB and RS232 interface await you as standard directly on board the Ethernet version connects professionally with the local network. By optionally equipping the printer with an encoder for magnetic stripes, smart cards or also RFID, you expand its functionality and produce plastic cards with added value. After printing, the cards are immediately written with information electronically, greatly expanding the scope of applications. A robust housing in an attractive design predestines the C-1 not only for rough surroundings, but in particular for demanding locations in POS or reception areas. The accustomed high ergonomics from Metapace ensures comfortable use and makes any maintenance simple under the printer cover the user has direct access to the colour ribbon, easily exchanging it within seconds or cleaning the printhead in a few easy steps. The scope of delivery offers you everything you need for fast integration all drivers are included along with the software, a USB cable as well as power supply for easy connection are included for free, while a cleaning kit and roll are also included as standard for long-term, carefree use.